The bravest people are the ones who dont mind looking like cowards. Giving up because of obstacles is an act of cowardice, but giving up is not a cowarldy act when you give up the bad personality you have and look for a chance to be a better person. The reason why most people don't reach their destination is that they are so afraid to fall that they open their parachute before they jump from the sky. We fell in love. Mine became ours, minutes turned to hours, chocolates and flowers, you made me brave when life created a coward. Cowardice is the act that depicts lack of courage by a person. Cowardice is often associated with those who see the right and not do it. William Shakespeare says, “Cowards die a thousand deaths. The valiant tastes of death, but once”. Instead of dying at every instance of cowardice, it is better to live for a short time bravely. 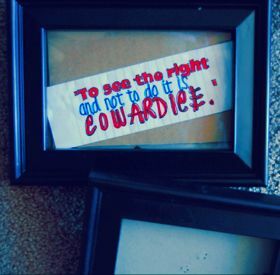 There is no use at all in being a coward. Cowardice is not at all impulsive. He does not think with his brains but his legs. He tries to run the very moment he gets a chance to do so. Cowards meekly surrender and have neither aim in life nor any morality. He who stands against all odds becomes a hero. Cowardice takes you nowhere but only nearer to your enemies and they can never have an ambition to be immortal. The history speaks only of brave men who have fought against all hurdles and not about cowards. So, here are quotes about cowardice and read them to share with others.